Our topics in P6 are technically called Thematic Units. 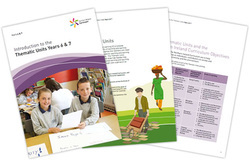 Thematic Units develop Ideas for Connected Learning (ICLs) which further and encourage children to make connections across the Areas of Learning. Each unit focuses on one of the aims of the curriculum and provides opportunities for the assessment of the skills of Communication, Using Mathematics and Using ICT.